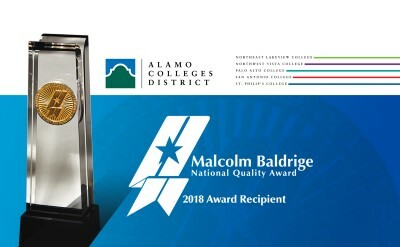 On November 15, 2018, U.S. Commerce Secretary Wilbur Ross today named the Alamo Colleges District a 2018 recipient of the Malcolm Baldrige National Quality Award (MBNQA), marking a significant milestone in the district’s ongoing journey to achieve the highest level of student success and performance excellence. A presidential-level honor celebrating its 31st anniversary, the award recognizes sustainable excellence through visionary leadership, organizational alignment, systemic improvement, and innovation. The award is the most prestigious honor a higher education institution can achieve for performance excellence in innovation, efficiency, and leadership. “These awardees are inspiring in so many ways,” Ross said. “Each honoree strengthens our economy through its organizational excellence and positive impacts for its customers, students, patients, and employees. They exemplify the American spirit in action and are role models for success in business and commerce.” ACD has been on its performance excellence journey for many years. The Alamo Colleges DSO and four of the district’s colleges have been awarded the Texas Award for Performance Excellence (TAPE) by the Quality Texas Foundation, which follows the Baldrige framework and is required to apply for the MBNQA. In 2016, the DSO was one of three organizations in the state to receive the TAPE. St. Philip’s College was one of only two organizations in the state to receive the 2018 TAPE and the only educational institution to win the award since 2016.